I was working this week at the JESS school in Dubai with former periodic table collaborator and good friend, Steve Bambury. We used the previous version of this table and despite it only being a year old, so much has changed in that short space of time. Now that the dust has settled a bit following the release of iOS 11 and the different app developers have had their chance to update their apps to being 64 bit (where the heck are you Tellagami??!! ), I’ve updated the table to take account of developments. 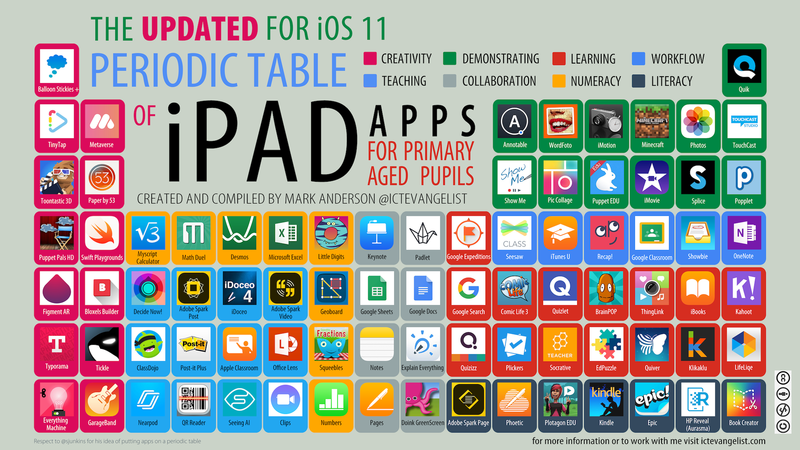 It’s been a year since I launched the periodic table of apps for primary aged pupils and the response to it has been overwhelming. With more than a million views on the site and hundreds of thousands of shares, retweets and likes, it’s always humbling to know that your resources are able to help schools and ultimately children, in the classroom. The Adventure Creator, Microsoft Classroom, Tellagami, Yakit Kids, Cospaces, Airplay, Pettson’s Inventions, PingPong Spot Networking and Questimate. I’ve added a bunch of new apps to the table including: Metaverse, Seeing AI, Microsoft Excel, Desmos graphing calculator, Apple’s Clips app, HP Reveal (formerly Aurasma), Quizizz for students, and Figment AR. A high resolution version of this can be downloaded and printed from here. I hope you find this just as useful as the others.